It was just another Saturday afternoon as I drove along Sunset Boulevard. In fact, I was heading back from the East Side performing my usual geekery at my weekend daytime coffee spot (not my weekday nighttime one) when I saw this from the seat of my MINI. Don’t worry – the traffic signal was red, then. And the billboard tripped me out. It actually said “Social Networking.” And to illustrate the point of the the concept (with nothing particular to say about it, per se – just the mention seemed to suffice) there were a few, varied tequila drinks next to the bottle of Patron. Patron be the common thread that binds all us geeks together! Or is it? I’m going to get metaphorical here. Patron isn’t my favorite (4 Copas and TezÃ³n are) nor is it even made with the best ingredients but it is certainly the most well-known. It’s assumed to be the highest quality because people generally don’t bother to do their research and Patron is where they default*. 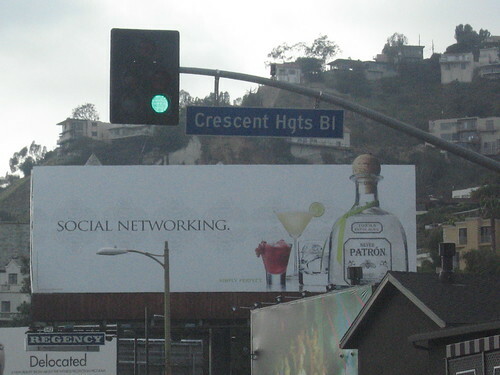 Patron, though, is most likely the only tequila brand that could afford the Sunset Boulevard space. It was indication that “Social Networking” wasn’t just geekery anymore. The concept had gone mainstream. Thus is why I tend to cringe that that term “networking” is used at all. Think real life. When you’re at a non-virtual party hoping for that opportunity to fall in your lap where you meet someone who can connect you to a winning lottery ticket (? ), do you tell your friends the next day that you were “networking?” When I hear “networking,” I think events that feel like tired college fairs filled with employers who rent booths as publicity stunts and to collect resumes only to filter through 100 of them – which go straight to the shredder – only to fill 1 position. Too contrived to yield anything constructive. “What can you do for me?” Sure, it could be the start of a working relationship. But like all relationships and meaningful contacts, it takes time. There is no incentive to waste resources on what looks on the surface to be like a dead lead. You mean to invest your time wisely and “networking” is no exception. That is, unless you are out of other options. That comes across, too. There has to be stratgy behind standing out amongst the rest. “Social networking” is so broad. I thought about it: Are there times where I actually say things like, “Yeah I gotta log into that chat tomorrow and get some ‘social networking’ done?” No. It’s the territory that comes with any label, I guess. Personally – I am all about meeting different kinds of people from all different backgrounds because doing that makes me a different person. I’m not looking for handouts. If anything comes about it, it came about from a relationship or friendship with another person. I don’t have answers here – just observations. And at the end of all this of course is, Twitter, Twitter. Twitter. Now that’s mainstream. * Angelenos, get edumacated about tequilas and see what’s really out there. Try El Carmen’s quarterly tequila tasting where around 10 tequila vendors give you a sampling of their silver, resposado or anejo formulas. Usually held on Saturdays from 5-8 PM. El Carmen provides the chips, salsa and other passed appetizers (and even *gasp* water!) all for $25. If you reserve your spot, you even get a souvenir El Carmen T-shirt. You won’t find Patron here. This entry was posted in Web, West Hollywood and tagged billboard, mainstream media, Patron, social media, social networking. Bookmark the permalink.